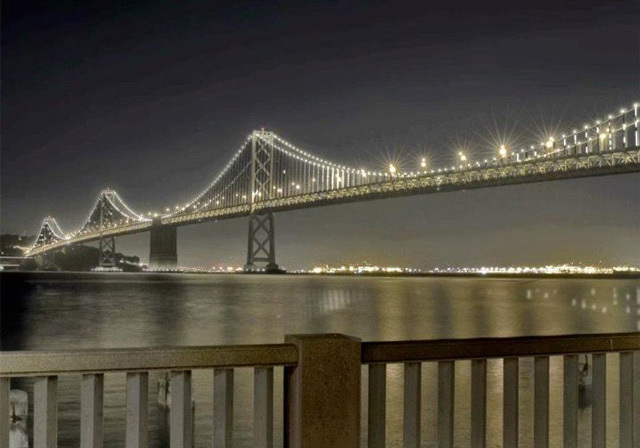 To commemorate the 75th Anniversary of the San Francisco – Oakland Bay Bridge, light artist Leo Villareal has designed a major art light installation for the north side of the bridge (facing downtown San Francisco). The light sculpture project is called The Bay Lights and will display an ever-changing show for two years with 30,000 white energy-efficient LED lights. The project is the brainchild of Ben Davis, founder of creative agency Words Pictures Ideas, who was inspired “after seeing Villareal’s work at the San Jose Museum of Art”, according to a recent statement from him about the installation. Fundraising efforts to create this sculpture have begun. Similar to the ambitious lighting of the Eiffel Tower for its 100th anniversary, The Bay Lights will commemorate the Bay Bridge’s 75th Diamond Anniversary at seven times the scale of the famous Parisian landmark. The installation will live for two years, providing a stunning fine-arts experience for the entire Bay Area and its visitors. Thanks to Jennifer Holmes for the tip!